Most Americans don’t realize that the Groundhog Day tradition they celebrate with parades, feasting, and skinny-dipping is actually derived from one their ancestors carried over on the Mayflower from old Germany. Of course we all know the Germans brought germs with them (that’s easy to remember as it is their namesake) but schoolchildren these days aren’t being taught the harder-learned lessons of their forebearers. During the Dark Ages, Germans had a ritual in early February in which they would sacrifice their firstborn aunt to a giant creature known as the Gründschwein. Standing 30 feet tall, wielding a giant, meaty oar (from which the term meteorologist is derived — not, as most schools teach, from the study of meteors), he would summon the destructive forces of the weather if not for these offerings. Often, this came in the form of a long winter, sometime lasting right through the summer and on up until labor day, casting a dark shadow on everyone’s vacation plans and barbecues. The creature feared nothing except the sun, but centuries went by before it came out again (remember, this was the Dark Ages), and once it began casting a shadow behind him, it frightened him so badly that he hid for six weeks every time he saw it, often before he had summoned even the tiniest tornado or blizzard. 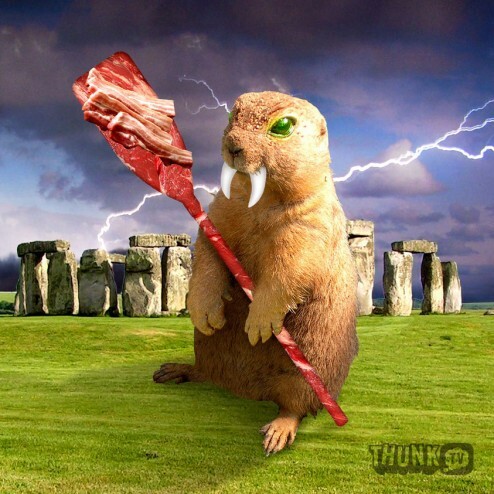 The entire notion of predicting the weather dates back to this tradition, and today the world relies heavily on a very simplified version of this ceremony to determine the end of winter, which involves a modern day groundhog, but we now know this is a gross distortion, as this common creature has no such abilities, never mind a magical oar wrapped in raw liver and bacon with which to wield power over the skies. But before the Gründschwein tradition spread throughout Europe and then onto the parts of the world that don’t smell like an armpit, people had no idea that they could predict the type of weather that was coming, and had no hope of being able to do so (much like anyone who watches Channel 4 News). Source: The Universe of Knowledge, with support from ThunkTV Research Dept. ©2013, all rights reserved, except the right of refusal, which we refuse.